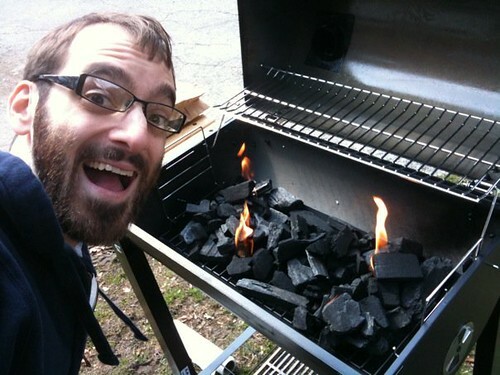 For the past ten years I have lived exclusively in places where I have not owned or had access to a grill. Aside from visits to my parents' house or a friend's house I have been unable to grill anything anytime I want. It's fitting that on the first day of spring (or is it the first full day of spring -- who knows?) that I was able to put an end to this terrible decade-long period of sadness. A couple of weeks ago I purchased a grill in preparation for the warmer weather. The grill was a bargain at $99. I thought this was a tremendous deal until I opened the box and found a barrel cut in half, four thousand screws, and a slip of paper that read: "You figure it out." Eventually I did figure it out. Unfortunately, what I hadn't figured on, was the four additional hours of curing time the grill needed before its first use. We had company coming over in about three hours so this suddenly made our dinner plans a little tighter than I'd originally thought. Luckily for us (unlucky for Caolan, Paul, and Laura -- our guests) they were running late! I did a poor job of following the directions on curing the grill. I was supposed to coat it in vegetable oil and maintain a temperature of 225 degrees for 2 hours. I overshot that a little and maintained the temperature around 600 degrees instead. Maintaining a grill at a temperature of only 225 degrees is a little challenging. It's like maintaining a pot of water on the stove at 90 degrees. After the first stage I maintained it at 400 degrees (actually 400 degrees this time) for an hour and let it cool for one hour. Just in time to load it back up with charcoal and get to it with the actual cooking just before our guests arrived. 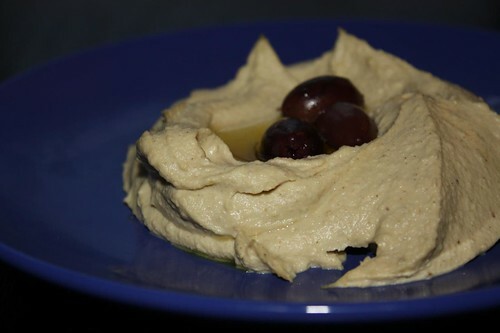 Jen garnished a little Greek hummus with some kalamata olives and olive oil and served it up with pita chips. This was the perfect distraction for everyone while I fumbled around in the yard with the grill. 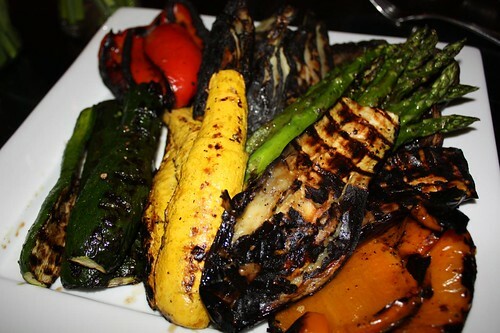 I started with some grilled vegetables: eggplant, zucchini, summer squash, fennel, red and yellow peppers, and asparagus with olive oil, salt, and pepper. There may have been some rosemary purchased for this but I foolishly forgot to add it. Then I just barely grilled this marinated skirt steak for about two minutes on each side. 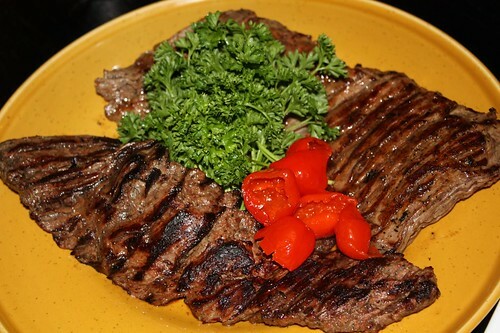 I served it with parsley and peppadew just to add a little color to the plate. I marinated the steak for about six hours in some Newman's Own dressing. I always feel like a complete sell out using salad dressing as a marinade but generally it works pretty well. I still think that next time I would opt to simply do a dry rub for skirt steak. I'm not sure the marinade is really necessary on this cut of meat. 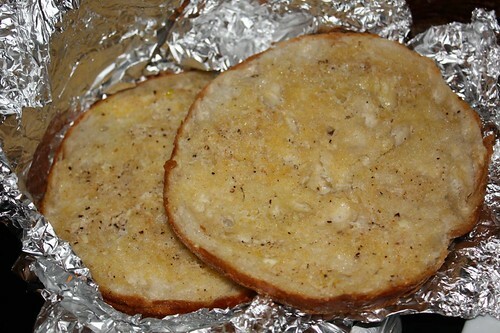 I also grilled up this foil-wrapped garlic bread. Jen made the garlic butter so I don't really know what was in it but the result was a giant garlic-butter sandwich that we cut up into slices and served along with the salad (not pictured) of red leaf, baby spinach, tomato, feta, and cucumber. 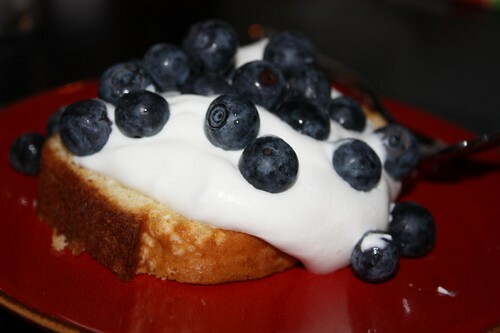 For dessert Jen made some delicious lemon cake that we served with whipped cream and blueberries. For the whipped cream Caolan presented an innovative new technique by which you pass the bowl around the table and everyone takes a turn whipping. At the end you have a bowl of whipped cream and no one has a sore arm! There is nothing I love more than the introduction to a previously undreamed culinary technique. Thanks for the delicious dinner and awesome company, you guys!! I'm glad to know that 1) our lateness made it possible for you to more fully cure the grill and 2) that you appreciated my whipped-cream technique! The problem with my technique is that everyone who is not Nate is much worse at whipping cream than he is, so our slow and awkward fumbling with the whisk is a little embarrassing. Yeah, but I'm like the team captain. I started it off and finished it up. It's like the baton race thing in the Olympics.